UPDATE: ISIS released video today (Sunday) on the brutal beheading. 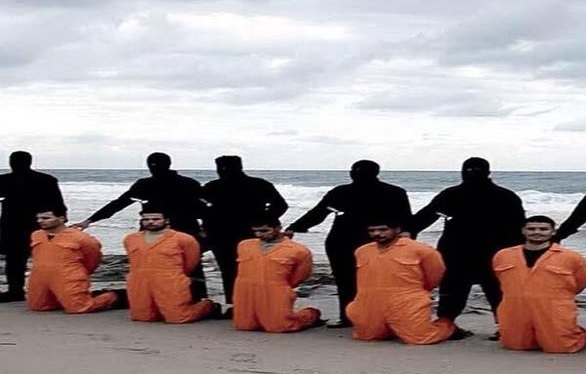 ISIS has reportedly executed 21 Coptic Christian hostages in Libya. The Christians were reportedly captured around New Year’s Day. Twenty-one Egyptian Christians kidnapped by Isis in Libya around New Year’s are feared dead, after Twitter accounts linked to the Libyan branch of the so-called “Islamic State” announced they had been slaughtered. There is no official confirmation yet but Egyptian media believe the news to be reliable and two pictures released by the same Twitter sources show what they describe as “the Islamic State carrying out the execution of Coptic prisoners in the province of Tripoli”. In the first picture five men wearing the notorious orange jumpsuit are kneeling while hooded hangmen armed with knives stand behind them. The caption, written in English, describes them as “the humiliated followers of the Coptic church”. In another picture more men wearing the orange jumpsuit appear in a line with their executioners under a message in English that reads “revenge for the Muslim women persecuted by Coptic crusaders in Egypt”. These pictures along with others were published by Dabiq, Isis’ online magazine in English, together with an announcement of the kidnapping but not of the execution.